Strabismus, or ocular misalignment, includes eyes that wander up, out, down or in, and is found in almost 4% of the US population. Strabismus is described in terms of the direction, location and frequency of wandering. Each type is associated with different causes and management protocols. Most strabismus results from an abnormal signaling mechanism from the brain, which controls eye movements. It is not usually an abnormality of the extraocular muscles themselves. For this reason, the brain plays a large role in developing and maintaining straight eyes. The ability to perceive depth, or to fuse the images from each eye, is the biggest factor in obtaining successful alignment. Complaints of double vision, or signs of intermittent misalignment, should be addressed immediately, before the brain adapts to suppress the wandering eye. Strabismus may be treated with glasses, patching, or surgery, depending on the etiology. Each child is different. Even if someone else’s child has responded to a particular therapy, this success may not be generalized to all children. Please feel free to ask our staff to explain the differences in therapy options, so that you may have a better understanding of why a certain treatment plan has been recommended. 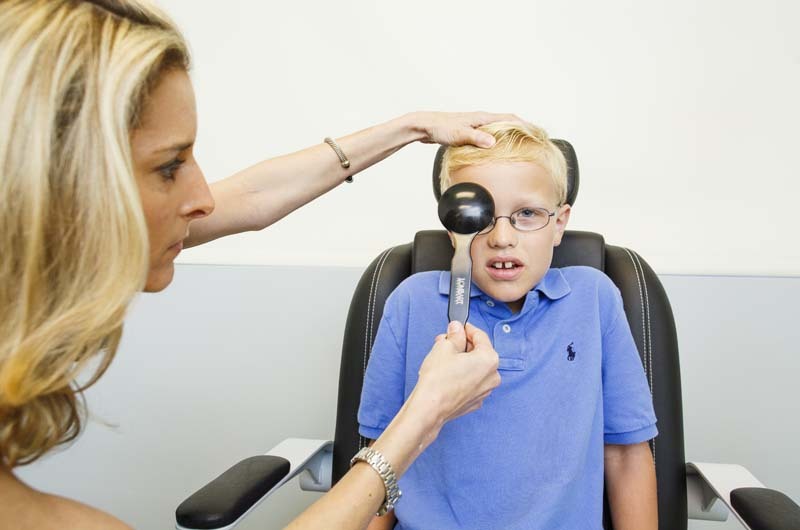 Here at Pediatric Eye Consultants of North Florida, we tailor each individual plan to the unique needs of your child. Eye crossing that is associated with hyperopia, or farsightedness. It results from focusing efforts and can be successfully treated with refractive correction. The degree of farsightedness may vary in these patients, and some children appear to “see fine” without their glasses. This is normal, and does not mean that glasses are unnecessary. Also, many children with accommodative esotropia will manifest recurrent misalignment when their glasses are off. This is expected, and does not signify a “worsening” of their condition. Even if your child requires glasses in childhood for accommodative esotropia, it is possible that glasses will be discontinued in their teen years, when accommodative esotropia frequently resolves. Eye crossing that does not respond to refractive correction. It may present in infancy or be associated with prematurity, hydrocephalus, developmental delay or a family history of strabismus. It may even present later in childhood or adulthood and be associated with symptoms of double vision. Patching and/or glasses may be recommended initially, but in general, strabismus surgery is often ultimately required. Children who develop esotropia within the first year of life should consider surgical intervention prior to the age of one. Multiple surgeries are often necessary and recurrence may be witnessed at any age. Children with infantile esotropia may expect to need multiple surgeries in their lifetime. Even if more than one surgery is required, straight eyes can be obtained. Re-operation is common in these cases and should be considered if it can improve binocularity, cosmesis or visual function. Outward wandering of one or both eyes, especially when fatigued or inattentive. It may be associated with “squinting” or eye rubbing behavior, or with complaints of “double vision”. Older children may report that they can “feel it” when the eye wanders, and may be able to control their misalignment with effort. Refractive correction, patching, and in some cases, convergence exercises may be of benefit. If episodes of misalignment become more frequent or increase in angle, strabismus surgery may be recommended. Surgical intervention during an intermittent, but decompensating stage often leads to better prognosis and retention of binocularity. We will test for signs of fatiguing control and suppression during your visit to help determine the right time for surgical intervention. The age of your child is seldom the most important factor in determining surgical timing.